A common goal and strategy. This approach, allows us to, throughout solution design, focus on the key levers that will impact positively on business value add. Our aim is therefore to, through mindful collaboration and true partnership with clients, deliver smart “Just-In-Time” solutions for the now, and future “Right-In-Time” solutions to create sustainable value over time. The solutions we specialise in are aligned with the approach described above, and aim to leverage business opportunities and address critical business challenges to realise targeted business benefits. To ensure continuous people performance whilst the internal operational environment constantly change, we deliver value added solutions through internal Surveys and Bench-marking, Project Integration and Transition Support, and Change Management. To build and sustain customer loyalty and satisfaction, the organisation as a whole needs to be aligned towards achieving client needs and requirements. Having the right information available for decision making will form the foundation of this alignment, and can easily and cost effectively be achieved through external Surveys and Benchmarking. The issue nowadays does not seem to be one of whether the realisation of strategy and business benefits are necessary (as Peter Drucker contended with saying “if you can’t measure it, you can’t manage it”), but more one of what should be measured and how. Our approach to Business Scorecards / Dashboards design helps to answer this question in a way that is appropriate and significant for each unique organisation. 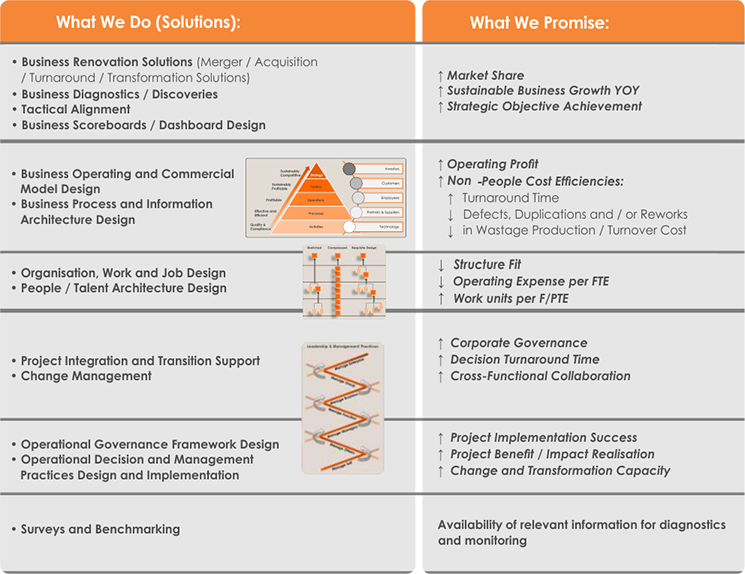 The solutions we specialise in are aligned with the approach described above, and aim to leverage business opportunities and address critical challenges in a value adding way to realise sustainable business benefits. In working with our clients, we follow a phased process, collaborating closely with them to design and implement smart and sustainable solutions that realise business benefits.